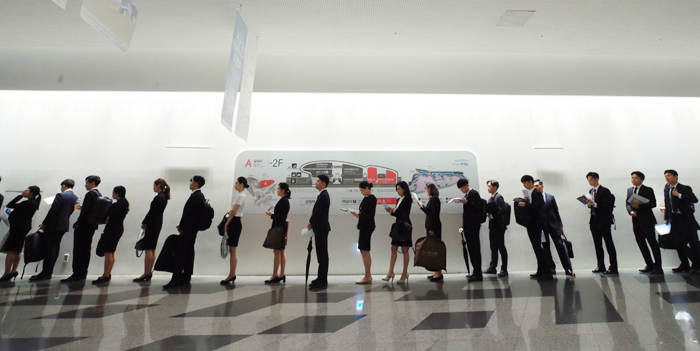 Only 3,000 new jobs were created in August, repeating the dismal performance of the previous month and resulting in unemployment over 1 million for eight months running, Statistics Korea said Wednesday. That is the longest period of high unemployment since the 1997 Asian financial crisis. Yet Cheong Wa Dae spokesman Kim Eui-kyeom claimed Wednesday that the crisis is simply "growing pains in the process of economic reform." Last year more than 300,000 jobs were created, but the growth has slowed to less than 100,000 so far this year and the country could see a net decline in September because of the long Chuseok holiday. Last month, 158,000 people in their 40s lost their jobs, the biggest drop in 27 years, while the youth unemployment stands at 10 percent, the highest since August 1999. 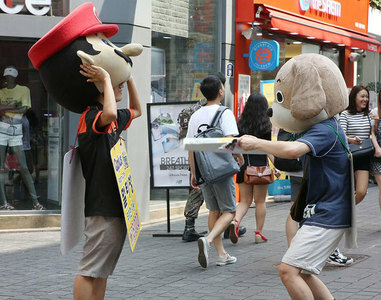 A total of 1.13 million people are officially unemployed, up 134,000 compared to a year ago and also the highest since August 1999, right after the Asian financial crisis, when 1.36 million Koreans were out of work. The employment rate in August stood at 66.5 percent, down more than 0.3 percentage point on-year. The main culprits are the drastic minimum-wage hike, which hit already struggling small employers, and massive layoffs in the shipbuilding and automotive industries. Many economists are saying that the government must admit the huge impact the minimum-wage hike had on employment, but Cheong Wa Dae continues to downplay the impact of the president's economic policies. News reports about the latest employment figures attracted thousands of comments criticizing the government's policy of income-driven economic growth.